Get clarity on contracts with the newly updated Contract Law in Wisconsin. From formation to rescission and reformation, this book covers key aspects of contracts. Order yours today! The Guardian ad Litem Handbook is Wisconsin's most comprehensive guide to being a GAL. Newly updated as a 5th edition, the Handbook is available now! Improve your trial performance by prepping with The Wisconsin Rules of Evidence: A Courtroom Handbook. It's newly updated and available as a 9th edition. Don't wait—order now! Newly updated for 2018-19, the Criminal Benchbook's easy-to-follow format guides you through the main stages of criminal and traffic law proceedings while providing statutory citations and case law references. Order yours now! When the American dream of home ownership turns into a financial nightmare, the realities of foreclosure can intersect with many legal practice areas, including bankruptcy, family law, probate, employment law, worker’s compensation, business law, and real estate and property law. Lawyers who understand the foreclosure process can help clients facing difficult circumstances. Mark Richard Cummisford, Marquette 2001, Marquette Univ. 2002 dispute resolution, is a coowner of Cummisford, Acevedo & Associates LLC, Oak Creek, practicing in creditors' rights, real estate, commercial recovery, civil litigation, and alternative dispute resolution. He previously worked for a Fortune 100 mortgage lender and servicer as a vice president and manager of departments responsible for foreclosures and contested foreclosures in all 50 states, credit risk recourse and recovery, and collection of losses associated with the purchase of faulty prime and subprime loans. Lawyers should first know what to expect before foreclosure. Generally, most creditors do not refer a delinquent loan to foreclosure until the mortgagor10 has been delinquent between 120 and 180 days. In other words, if a mortgagor last made a payment in December and the next payment is due on January 1, the creditor usually will wait until May, June, or even July to initiate foreclosure proceedings. In the meantime, the creditor's collections department will make numerous attempts to contact the mortgagor(s) to determine the reason for the delinquency and to offer any loss mitigation alternatives, which are required by most agency regulations, creditors, and investors. The creditor usually is required by the terms of the mortgage to send a notice of intent to accelerate (or a similar document), which gives the mortgagor the right to cure the default by reinstating the loan. The notice states the total amount due and a deadline for payment. If no payment is received, the creditor will refer the file to a foreclosure attorney to initiate a judicial foreclosure action. The judicial foreclosure process is fairly straightforward. This article describes the various stages, so that lawyers understand the process and know what their clients in foreclosure should expect, even if the lawyer practices in seemingly unrelated areas of the law. The unfortunate realities of foreclosure often intersect with client issues involving bankruptcy law, family law, probate law, employment and worker's compensation law, personal injury, business law, and real estate and property law, among other practice areas. Although those intersections are outside the scope of this article, understanding the foreclosure process can help lawyers provide clients with the best advice possible under difficult circumstances. The summons is filed and served in accordance with the rules of civil procedure. It is important to note that the time period allowed for the defendants11 to file an answer or other responsive pleading is 20 days, 45 days if the defendant is the state of Wisconsin, or 60 days if the defendant is the United States. The complaint alleges that the mortgagor(s) executed a note and mortgage and failed to make payments in accordance with the terms of the note. The creditor usually names as defendants any and all parties who have, or may have, an interest in the mortgaged premises. Parties with an interest might include the mortgagor's spouse (even if unknown to the creditor), any tenants (even if unknown to the creditor), any junior and subordinate mortgage holders, and any junior and subordinate judgment lien holders. The allegations often will address the various factors described below, which will support the appropriate redemption periods, also described below. All defendants must be served with an authenticated copy of the summons and complaint in accordance with Wis. Stat. chapter 801. Whenever possible, the process server will serve the mortgagor(s) personally as soon as possible after filing. If personal service is not made after several attempts, substitute service is acceptable provided the process server exercised due diligence. When neither personal nor substitute service is accomplished, a summons usually will be published pursuant to Wis. Stat. chapter 985. The summons usually will be published in a local paper in the county in which the property is located, because that county's circuit court has in rem jurisdiction in real estate mortgage foreclosures. When the summons and complaint name other parties as defendants, service of process is accomplished by serving the registered agent (if a corporation). If the defendant is a governmental agency or is represented by an attorney, service of process can be considered completed by an admission of service. If a client is served with a foreclosure summons and complaint, immediate action is necessary to ensure that the lawyer has an opportunity to file an answer, affirmative defenses, and counterclaims. Defending a foreclosure can be difficult if the mortgagor truly is in default and financially unable to reinstate the loan. The most common defenses can be categorized as a "general denial" and a "payment dispute." Under either defense, the creditor usually can prove the default and obtain a judgment of foreclosure, unless the mortgagor raises a genuine issue of material fact. For example, proof that the mortgagor made payments that were misapplied or not applied to the account by the creditor usually is enough to raise a genuine issue of material fact. However, obtaining such proof is more difficult than one might think. 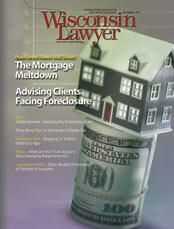 In many situations, the mortgagor's responsive filing containing a general denial or alleging a payment dispute turns out to be more a cry for help than a legitimate defense. A mortgagor may have a more complicated fact scenario, which could rise to the level of affirmative defenses, counterclaims, and cross claims against third parties, such as appraisers, mortgage brokers, and so on. Such defenses can include allegations of violations of the Fair Debt Collection Practices Act,12 the Truth in Lending Act, the Fair Credit Reporting Act, or the Real Estate Settlement Procedures Act, or a variety of other claims, which can be categorized generally and loosely as allegations of "predatory lending," and are beyond the scope of this article. In an overwhelming majority of cases, the creditor obtains a foreclosure judgment with relative ease. Lawyers representing clients in foreclosure should pay special attention to whether the creditor is seeking, or waiving, its right to a deficiency judgment. Most large national lenders foreclosing in Wisconsin waive any and all rights to a deficiency judgment, because doing so reduces the length of the redemption period, usually by 50 percent. Six weeks before the redemption period expires, the creditor's attorney will schedule a sheriff's sale, which is a public auction of the mortgaged premises held in the county in which the property is located. Scheduling a date for a sheriff's sale usually occurs approximately six weeks before the actual date of sale, which can be held at any time after the redemption period expires. The creditor must comply with notice, posting, and publication requirements.22 The creditor must publish the legal notice of sheriff's sale one time per week for six consecutive weeks immediately before the sale23 in a newspaper within the county in which the property is located. In addition, the sheriff's department posts the notice in six public locations during the same period. Sheriff's sales are held at the county courthouse and are open to the public. The property sells to the highest bidder after the creditor's representative opens bidding at a predetermined price. Often, the creditor is the only bidder and becomes the purchaser. Occasionally, a third party outbids the creditor and becomes the purchaser, subject to the sale terms and court confirmation. The final step in the judicial foreclosure process is the confirmation of sale hearing, which usually is scheduled as soon as possible after the sale. The primary purpose of this final hearing is to allow the court to validate the foreclosure process and sale, to ensure that the process was conducted in accordance with the law and that the property sold for a fair value.24 The creditor also uses the hearing to make additions to the judgment amount and to obtain a writ of assistance,25 for use if it becomes necessary to evict occupants of the property after the sale is confirmed, the deed is recorded, and the conveyance is complete. Although the creditor usually will instruct its attorney to push through the judicial foreclosure process as quickly as possible, the creditor usually does not want to take the mortgaged property. The creditor simply wants what it bargained for in the first place - repayment of the amounts owed. To accomplish that objective, the creditor usually will offer delinquent mortgagors one or more alternatives to foreclosure, usually referred to as either loss mitigation, loan workout, or workout. Such arrangements usually are voluntary and must be negotiated between the mortgagor and the creditor. Several of these common alternatives to foreclosure are described below in the order of most creditors' preference and willingness to use. Reinstatement. Mortgagors may have a contractual right to cure the default. Such language usually can be found buried within the mortgage, most often in the document's default provisions. The right to cure requires the mortgagor to reinstate the loan by paying the full amount due including principal payments, accrued interest, late fees, no sufficient funds (NSF) charges, escrow advances and deposits, and reimbursement of any of the creditor's out-of-pocket expenses (usually called "corporate advances" or "recoverable advances"). The full amount due also will include reimbursement of the creditor's attorney fees and foreclosure costs. Although the right to cure may not extend (technically and legally) past the date the lawsuit is filed, most lenders will allow a mortgagor to reinstate at almost any reasonable time before the sheriff's sale. To determine how much a client must pay to reinstate the loan, simply request a reinstatement quote good through the date the client plans to pay the total amount owed to reinstate. Repayment Plan. If the mortgagor is unable to pay the full amount required to reinstate the loan, some lenders will allow the mortgagor to repay the arrearage over time while continuing to make normal monthly payments. This type of arrearage repayment arrangement is repaid in a manner similar to the way a Chapter 13 bankruptcy plan operates (although the mortgagor does not have to file bankruptcy). Forbearance Agreement. In certain circumstances, the creditor may allow the arrearage to be added to the end of the loan term, by agreeing to extend the loan's term. Such agreements usually are drafted by the creditor's lawyer and will require the mortgagor to stay current with normal monthly payments. Short Sale and Short Payoff. The creditor may recognize an economic benefit of minimizing losses by taking what it can get. A short sale or short payoff allows the mortgagor to sell, or refinance, the property at a price that will net the highest amount possible even though the net amount may not be enough to pay off the outstanding loan balance. The creditor's loss mitigation department might conduct an analysis to determine whether this option is better for the creditor than foreclosure would be. Short sales and short payoffs often are negotiated by professional negotiators such as real estate agents, brokers, or lawyers, acting on behalf of the mortgagor. To determine the total amount due for a client to pay off the loan, request a payoff quote from the creditor. Bankruptcy. Filing bankruptcy is a common method used to forestall foreclosure. In a Chapter 13 bankruptcy, the prepetition arrearage (that is, the delinquent amount owed) is put into the Chapter 13 debt repayment plan and is repaid over 36 to 60 months. However, this approach requires the mortgagor (now referred to as the debtor) to make normal monthly mortgage payments while also making Chapter 13 plan payments to repay scheduled debts. Other mortgagors may choose the less common approach of filing a Chapter 7 bankruptcy to discharge other debt while reaffirming the mortgage loan debt in an attempt to keep the mortgaged property. Avoiding foreclosure assumes that the mortgagor has the financial ability to keep current with monthly mortgage payments. Unfortunately, a failure to make timely payments usually results in the creditor receiving relief from automatic stay, which allows the creditor to foreclose despite the ongoing bankruptcy. Deed in Lieu of Foreclosure. When foreclosure becomes inevitable, the creditor might consider accepting a deed in lieu of foreclosure. This process allows the creditor and the mortgagor to avoid the time, expense, and aggravation of foreclosure. The creditor's decision to accept a deed in lieu of foreclosure usually is made only after reviewing a full title report. The creditor's review of a title report will consider the value of the property, other liens and mortgages against the property, the status of paid and unpaid real estate taxes, and the projected costs of holding and selling the property. Loan Modification. On rare occasions, a creditor may agree to modify the terms and conditions of the note, such as by changing the interest rate, loan term, payment amounts, or escrow requirements. Loan modifications usually are negotiated by the creditor's servicing agent, but they require the approval of the investor. Loan modification approvals are not standard practice and should not be expected. Unless the creditor has a compelling reason to modify the loan, this alternative usually is the creditor's least preferable option. Foreclosure can have a profound and devastating effect on the clients of lawyers who practice in many areas of the law. Lawyers may find themselves giving advice related to foreclosure and should understand the basic processes, time frames, and alternatives. Lawyers may be able to assist their clients in defending foreclosures, avoiding foreclosure, delaying foreclosure sales, negotiating alternatives to foreclosure, and exercising clients' rights to cure the default or redeem the property. When necessary, lawyers may need to advise clients to file bankruptcy or to relinquish the property by providing the creditor with a deed in lieu of foreclosure. Lawyers in all practice areas should be able to provide valuable insight, objectiveness, and advice to clients in foreclosure. Knowledgeable legal representation can be invaluable to clients facing the personal and financial crisis of mortgage foreclosure. 1A prime mortgage loan usually is extended to borrowers with an excellent credit history and high credit scores. 2A subprime mortgage loan usually is extended to borrowers with no credit history, or a poor credit history and low credit scores. 3During the first nine months of 2007, 14,733 Wisconsin homes entered the foreclosure process. See www.wisbusiness.com. 4One-to-four family owner-occupied properties are treated differently than nonowner-occupied one-to-four family and commercial properties. See Wis. Stat. § 846.103. 5Parcels larger than 20 acres are treated differently than parcels smaller than 20 acres. See Wis. Stat. § 846.10. 6Owner-occupied properties are treated differently than nonowner-occupied properties. See Wis. Stat. § 846.101. 7Abandoned properties are treated differently than properties under the borrower's control. See Wis. Stat. § 846.102. 8The term creditor is used as a general term throughout this article and refers to the mortgagee, including but not limited to banks, investors, lenders, mortgage companies, mortgage servicers, and governmental and quasi-governmental agencies, which typically become the plaintiff in judicial foreclosure actions. 9The postjudgment/presale redemption period usually is reduced if the creditor waives all rights to seek a deficiency judgment. See Wis. Stat. §§ 846.10, .101, .102, .103. 10The term mortgagor is used as a general term throughout this article and refers to the owner of the mortgaged real estate, including but not limited to the borrower or debtor, who usually becomes the defendant in a judicial foreclosure action. 11Parties named as defendants in a foreclosure may include, but are not limited to, spouses with possible marital property interests, tenants with leasehold interests, junior mortgage holders, and other junior lien holders, which may include the state of Wisconsin or the United States. 12Fair Debt Collection Practices Act, 15 U.S.C. § 1692. 13Wis. Stat. § 806.02. Creditors obtain judgment by default when mortgagors fail to appear or answer. 24Wis. Stat. § 846.165; see also First Wisconsin Nat'l Bank of Oshkosh vs. KSW Inv., 71 Wis. 2d 359, 238 N.W.2d 123 (1976). 25A writ of assistance gives the sheriff's department authority to remove (evict) the occupants and their personal property.